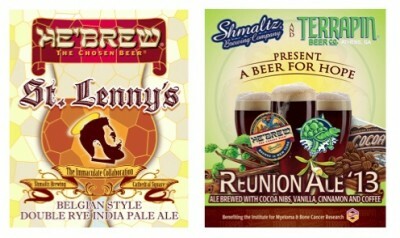 CLIFTON PARK, N.Y. — Shmaltz Brewing Company is all about collaborations this fall with the limited-edition release of two sensational new offerings: St. Lenny’s® - The Immaculate Collaboration parallels Reunion Ale ’13 – A Beer for Hope®. Shmaltz partners with Missouri’s Cathedral Square Brewing Company for the debut release of St. Lenny’s®, a Belgian Style Double Rye India Pale Ale. Shmaltz teams up for the third year-in-a-row with Terrapin Beer Company and Alan Shapiro (founder of SBS Imports) to create Reunion Ale ’13, a Dark Imperial Brown Ale Brewed with Cocoa Nibs, Vanilla, Cinnamon and Coffee. A portion of the proceeds from Reunion Ale ’13® is donated directly to The Institute for Myeloma and Bone Cancer Research. National fundraising events will occur throughout the summer and fall. For its 10th Anniversary in 2006, Shmaltz brewed the first batch of Bittersweet Lenny’s R.I.P.A.® to commemorate the 40th anniversary of the death of prophetic Jewish comedian Lenny Bruce. The rye-based double IPA went on to win two Gold medals at the World Beer Championships (2010 & 2011), and it currently holds a 99 Rating with BeerAdvocate.com and 98 Rating with RateBeer.com. It’s barrel-aged incarnation, R.I.P.A. on Rye® took home Silver medals at both the Great American Beer Festival (2010, Wood & Barrel Aged Strong Beer Category) and National Wood-Aged Beer Competition (2010) — stay tuned for the new limited release aged in Willett barrels coming in fall 2013. 2013 brings “The Immaculate Collaboration” — a labor of personal history and love of beer and shtick between two longtime friends and colleagues from Shmaltz and Cathedral Square. Jeremy Cowan, Shmaltz Brewing proprietor, comments, “Now with our own brand new brewery, for the first time we have the kind of freedom and the opportunity to do a special project like this. After a decade of shared brewing connections, I couldn’t be more excited to cook up St. Lenny’s with brewmaster Brian Neville at Cathedral Square. I’m still mad that he coined the exceptional names — but can’t wait to share the amazing flavors with our cult of He’brew® enthusiasts.” St. Lenny’s® flips the award-winning rye double IPA on its head using a custom Belgian yeast blend (2 Trappists and 1 Abbey) with the original R.I.P.A.® recipe. With a spicy punch of rye and caraway, fruity clove and anise flavors, and a gorgeous Belgian character, St. Lenny’s® is destined to intrigue hop heads and Belgian beer fans alike. Shmaltz Brewing proudly joins Terrapin Beer Company and Alan Shapiro (founder of SBS Imports) to participate in brewing Reunion Ale ’13 – A Beer for Hope®. Reunion® is brewed annually in memory of Virginia MacLean, a dedicated cancer research supporter who lost her own battle with Multiple Myeloma in 2007 and a dear friend and co-worker of Alan Shapiro and Pete Slosberg’s (creator of Pete’s Wicked Ale™). As a tribute to Virginia, a portion of the proceeds from Reunion Ale ’13® is donated to the IMBCR. Reunion Ale ’13 is a dark Imperial Brown Ale brewed with vanilla, cinnamon, and cocoa nibs from Nashville, Tennessee’s Olive and Sinclair Chocolate Company. Local favorites Creekside Café & Coffee House (Glenville, NY) and Brooklyn Roasting Company (Brooklyn, NY) contributed signature dark roasts to this year’s recipe. Following its initial release in 2007, the Reunion project has raised more than $130,000 for the IMBCR through bottle and draft sales of Reunion®, retailer fundraising events, and private donations. Beer lovers can also donate money directly through the Reunion website, the Reunion Facebook page, or the IMBCR website. Reunion Ale ’13 is now available in 22 oz bottles, as well as limited amounts of draft in the nearly 40 U.S. states that receive distribution from Terrapin and Shmaltz – and in Western Canada, through Shmaltz’s distribution network. The Institute for Myeloma and Bone Cancer Research is dedicated to independent research on developing effective therapies that improve the quality of life and longevity of patients with myeloma and bone cancer. Myeloma and bone cancer are two of the fastest growing diseases in the world, afflicting more than one million people in the U.S. alone. Founder and still sole proprietor Jeremy Cowan established the company in San Francisco in 1996 with the first 100 cases of He’brew Beer®. He’brew® now sells across 35 states, through 40 wholesalers and nearly 4,000 retailers. In 2007, Shmaltz released a new line of craft brewed lagers under the Coney Island® banner. In 2010/11, Cowan published his small business memoir, Craft Beer Bar Mitzvah: How It Took 13 Years, Extreme Jewish Brewing, and Circus Sideshow Freaks to Make Shmaltz Brewing Company an International Success. A free sampling of Chapter One and suggested beer pairings, can be viewed at http://www.craftbeerbarmitzvah.com. In 2012, Cowan spearheaded the creation of the non-profit New York City Brewers Guild (which manages NYC Beer Week) and serves as its President.